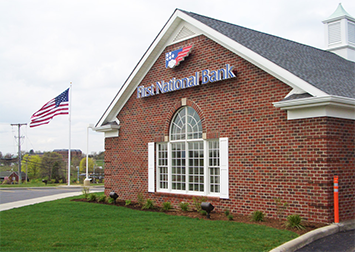 First National Bank in West Jefferson, North Carolina offers many services and products designed to make your life easier. Our dependable staff can assist you with all your consumer banking, commercial banking and wealth management needs. To learn more about our convenient banking solutions near you, visit us at 1488 Mount Jefferson Rd or give us a call today at 336-246-9800. This FNB branch in West Jefferson, NC is located at 1488 Mount Jefferson Rd and includes a 24-hour ATM for your banking convenience.Our friendly team members are happy to assist you during normal business hours. Or, for after-hours banking, you can use our ATM to make deposits, withdraw cash or check your balance. First National Bank was founded in 1864, and offers a full range of commercial banking, consumer banking and wealth management solutions. If you are coming from near Jefferson, NC, head west on E Main St and turn left onto S Main St. Turn left onto Long St and then turn right onto US-221 S. After 1.9 miles turn left toward Mt Jefferson Rd and then turn right onto Mt Jefferson. Arrive at First National Bank (1488 Mt Jefferson Rd, West Jefferson, NC 28694). If you are coming from near Fleetwood, NC, head northeast on Railroad Grade Rd toward Ghost Haven and turn left onto US-221 N. Turn right toward Mt Jefferson Rd and then turn left onto Mt Jefferson. Arrive at First National Bank (1488 Mt Jefferson Rd, West Jefferson, NC 28694). If you are coming from near Glendale Springs, NC, head northwest on NC-16 N toward NC-16 S for 4.1 miles and turn left onto NC-16 N/NC-88 W. After 4.1 miles continue onto US-221 S/Rocky Ridge Rd/U.S. Hwy 221 N for 2.6 miles. Turn left toward Mt Jefferson Rd and then turn right onto Mt Jefferson. Arrive at First National Bank (1488 Mt Jefferson Rd, West Jefferson, NC 28694). If you are coming from near Beaver Creek, NC, head southeast on Buck Mountain Cir and turn left onto Beaver Creek School Rd. Turn right onto US-221 BUS S and then turn left at the 1st cross street onto US-221 N. Turn right toward Mt Jefferson Rd and then turn left onto Mt Jefferson. Arrive at First National Bank (1488 Mt Jefferson Rd, West Jefferson, NC 28694).